Happy mother’s day I say. I got her an SUV. Of course, the flashy Mugen Honda S2000 is my new favorite. I’ve only seen one S2000 in Malaysia, plus Mazda RX-8s are too common. Okay so it’s a two-seater and it’s a convertible, not exactly practical in Malaysia. 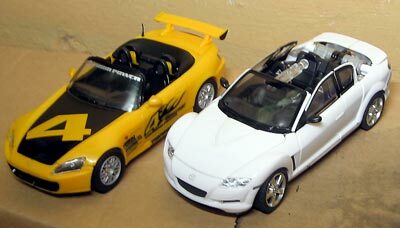 So I itched and made my RX-8 a convertible too. 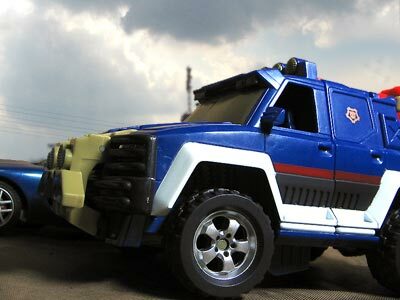 Meet Decepticharge, a new release from the Transformers Alternators series. He’d jab you if only his fists weren’t swapped! Well, nothing a positive head with a positive-head Philips screwdriver can’t fix. He is a skinny-legged top-heavy warrior. You gotta dig how he folds the bonnet to his back, instead of him lugging his car shell with him. Now, if you don’t have a Honda S2000, which one should you get? 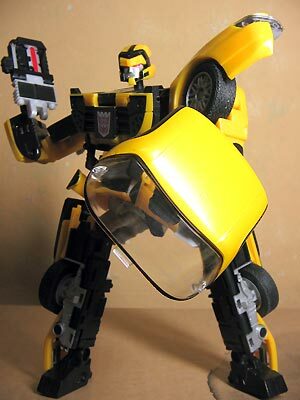 The spanking new dirty yellow Decepticharge, or the classic Autobot red Windcharger? Windcharger, I say; Decepticharge’s color tones are uneven from painted roof to door to floor. The sporty decals are fictitious and don’t look as appealing as Smokescreen’s. The bonnet (engine cover) is painted black, a retro scheme. I should have followed my instincts (humans have them, use it!) and bought a red Windcharger instead of the spanking new Decepticharge in the shop. 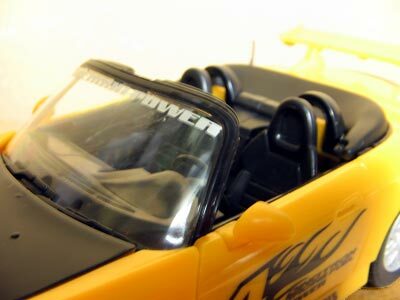 Immediately you can see that the door and roof seams are nowhere as nice as Windcharger’s (maybe the color hides it). I couldn’t get it to align properly. Transformers Energon Powerlinking Ironhide however was a pleasant surprise. 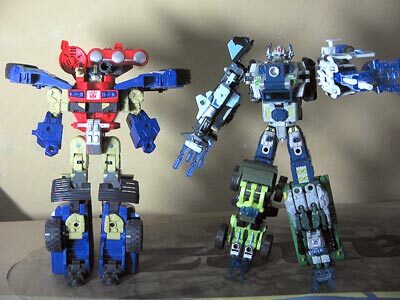 His legs can be extended to match the height of a gestalt (combiner). 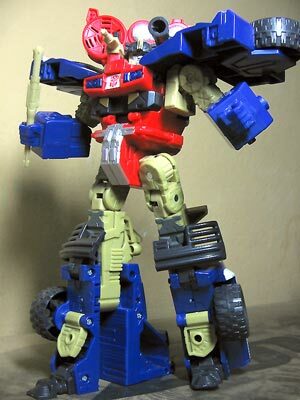 Powerlink Optimus (Energon Hotshot below): Hey I think you got on backwards. 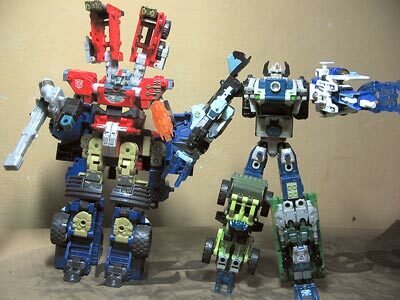 Yes it’s true; big Powerlink dudes can Powerlink with small Powerlink dudes. Though big guys shouldn’t be on top or you get Optimus Primal’s big-armed syndrome. That’s more like it. Small arms but it looks much more massive. Added 6 hours later: Ironhide’s turret head can be removed, so he looks like a proper SUV! Rejoice, YK! 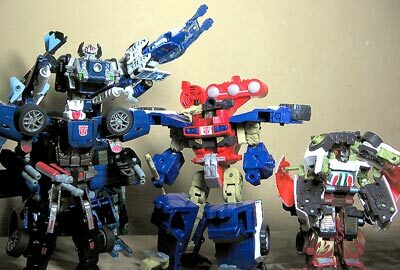 The big family: Left to right: Tracks, my hybrid combiner, Ironhide, Powerlink Downshift (with Rodimus underneath). 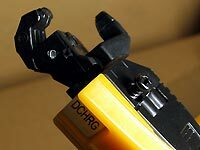 This entry was posted in Pictures, Toys on May 26, 2005 by 2konbla. Gakk! where’s the Hasbro QC? E Ironhide doesn’t look as bad as what I have heard from people. 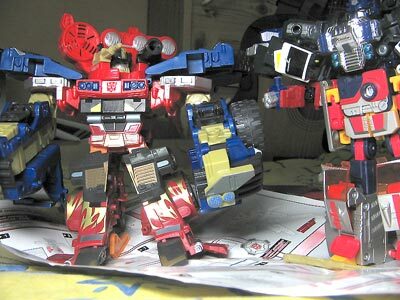 Yes, these Mega size powerlinkers is better in pant mode when combining with the deluxe powerlinkers. 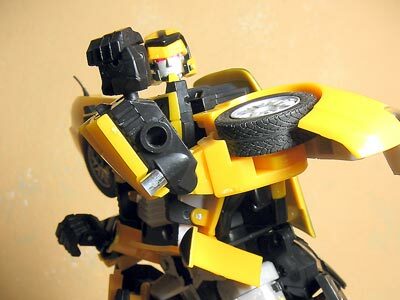 Oh man, I tot you are getting Windcharger ? The red goes with ur blue tracks and white meister. i want a mention please. 11 more days and i can go to gigs again! there’s bunch of s2000 around. I think it’s not really popular here anyway, besides even for me, s2000 is a waste of money. Better off with mx-5, lotus elise or rx-7 fc.